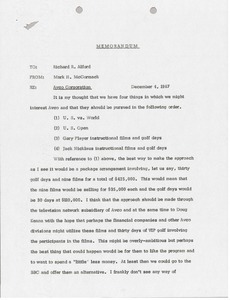 Cleveland (Ohio) - McCormack writes to the International Wool Secretariat, John Wilcox, regarding Gary Player's retail store appearances in England and how his expenses will be handled during that trip. 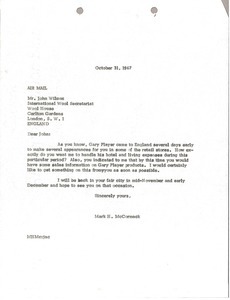 McCormack also inquires about Player's product sales information. 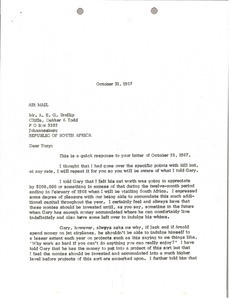 Cleveland (Ohio) - McCormack informs Trollip of Gary Player's capital, investments and attitude towards his financial situation compared to that of Arnold Palmer or Jack Nicklaus. McCormack discourages Player from unwisely spending his money.